We were in Whistler, B.C. 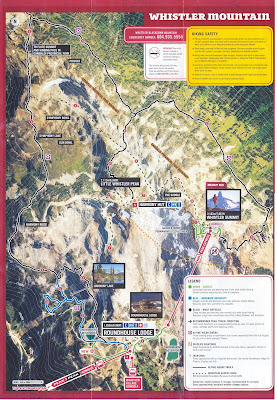 for zip lining (with Ziprek) on Saturday and planned a nice hike for Sunday: the High Note Trail Hike. You take the Whistler Village Gondola to the Peak Express Chair to get to Whistler Summit. You have arrived at the right spot when you see an big stone man, an Inuksuk marker, "Ilanaaq", the mascot logo of the 2010 Winter Olympics. From there follow the signs or the map that is readily available everywhere you look (a piece of it is shown here). The High Note Trail is marked as #5 and comes in at about 9.4 km. This loop trail starts at the Peak Express chairlift and ends at the Roundhouse Lodge, lower than you started. From the Roundhouse Lodge, you can go back down or take the Peak 2 Peak Gondola across to Blackcomb. In terms of plants and animals, we saw many alpine flowers and two big hoary marmots (Marmota caligata) munching away on them, lupine to be exact. Whistler Mountain gets its name from the piercing whistle the marmots make when they detect danger. The etymology of the generic name derives from Middle French word for mountain. “The etymology of the specific epithet is derived from caligatus (L), booted, a reference to the black or blackish brown feet (Brown 1956).” according to the Alaska Geographic site. One day out of the blue we tried a young coconut and we were hooked. For six months now we’ve purchased and enjoyed a couple of coconuts a week. From an average young coconut we’ve typically gotten about 1 to 2 cups of coconut water. Not that weak stuff that is all the rage today, but real thick, tasty stuff. Then there is the meat. It's a perfect snack (at least for one half of Travelmarx). So it’s only natural that we would figure out how to feature the generic name Cocos with the food. The specific epithet nucifera was a bit too long to spell out. In the process of preparing this post, we learned several things. First, we were opening the coconut (really the bottom of the coconut) the hard way. There are many videos showing the-whack-it-once and twist and off comes the cap. In the pictures here, we removed a large part of the coconut and there are ragged edges. Not so smooth. Oh well. There is the entertaining coconut-themed site Cooky Coconuts that has a lot of backstory about the coconut. Second, we were removing the plastic wrap surrounding the young coconut, and most people suggest keeping it on while cutting. The The Commercial Storage of Fruits, Vegetables, and Florist and Nursery Stocks (see coconut section) says that commercially sold coconuts (all?) are dipped in 1 to 3% sodium meta-bisulfite for 2 to 5 minutes before wrapping. Sometimes fungicide is used. So to avoid possibly mashing any chemicals into your cutting board, keep the plastic on. Third, why are they called young coconuts? Young coconuts (sometimes called young Thai coconuts because most seem to be a product of Thailand) are just immature coconuts, about 6 to 9 months old. The white part surrounding the young coconuts is called the husk (coir). The white meat inside the brown shell is endosperm or “spoon meat” because you can remove it with a spoon (though we just learned a hard spatula or ice cream scoop work nicely.) Spoon meat is what we wrote the word “cocos” with. Fourth, coconuts are not nuts, but drupes. The “spoon meat” is solid endosperm and the liquid inside is liquid endosperm. 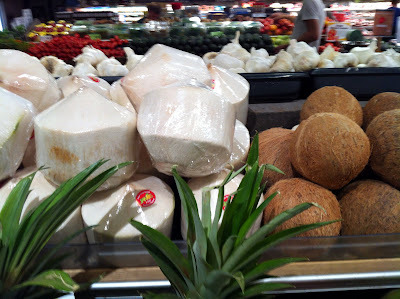 Finally, why are young coconuts shaped as they are when you see them at the grocery store? The ones we buy are conical at one end and flat at the other. Here are our guesses: 1) They are shaped this way for shipping considerations. When shipping uniformity is good and some non-round shapes are easier to pack. 2) The shape is traditionally how they are presented in countries where coconuts are grown? 3) The shape helps guide buyers in terms of how to use the young coconut. Pointy end is the end you should work with and remove to get inside. 4) The shape is a branding decision, unique to different growers. There are other possible shapes like diamond or teardrop. In the pictures shown here, the coconut meat (endosperm) is separated from a piece endocarp (hard brown part) and then carved up to spell Cocos. According to Quattrocchi Cocos has the following origin: “Portuguese and Spanish coco ‘mask, head, ape, bugbear, monkey face,’ the three scars on the base of the shell resemble a monkey’s face.” The specific epithet nucifera means “nut bearing”. It sounds better than drupifera? Our preparation of the young coconut. We have shaved the husk more than needed and we’ve cut the “top cap” off far down, more than is needed. Also, notice no plastic surrounding the husk. In the future, we’ll be keeping the plastic on considering the chance of chemical contamination of the cutting board. This coconut yielded about a cup and a half of coconut milk. Why not turn a yard chore - trimming the lavender - into something more interesting like collecting the dried flower spikes and displaying them? All of the spikes are past their prime, not a hint of purple left, just brown and green. The bees are done with them. Yet, in this is dried out state they still have a sweet, if not subdued perfume - kind of like beeswax. The spikes shown here came from three plants - all with purple-colored bracts. Other lavenders in our yard have yellow, raspberry, and white bract colors (see Lavandula Summer – Raspberry Ruffles, Madrid Blue, and Lemon Leigh). The spikes shown here are Lavandula stoechas, called by many common names, but we prefer Spanish Lavender. It is distinctive in its appearance with “rabbit ears” on top which are really sterile bracts. Latin lavo, as, lavi, lavatum, are, and lavo, is, lavi, lautum, ere “to wash”; Medieval Latin lavendula and livendula possibly connected with lividus, a, um “bluish, blue”; see Carl Linnaeus, Species Plantarum. 572. 1753 and Genera Plantarum. Ed. 5. 249. 1754. From the Frioul Islands (located off the Mediterranean coast of France, near Marseille) we jump to the United States, Zanesville Ohio to be exact, where the clay found there went into the two Weller Pearl pottery pieces shown here that contain the dried lavender spikes. The Pearl line features draped bead in green, rose, and black, accented with a green banded collar and punctuated by rosettes. The body of the pieces is ivory trimmed in black at the lip. The Weller Pottery Company created a wide-range of designs, from art ware to functional ware from the 1870s to the 1940s. The Pearl line was produced and sold in the late teens (~1918). This year, I decided to fill the bowl less and keep the little rabbit ears on. I mixed in Lavandula stoechas ‘Lemon Leigh’ with the common purple L. stoechas.